Classic Commemoratives, those issued from 1892 to 1954, have become one of the most popular series in recent years. There are 144 varieties of silver issues, of which all but two are half dollars (one is a quarter, the other is a dollar). Many collectors build type sets, which include 50 issues. 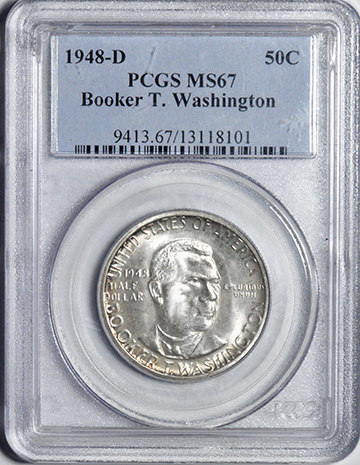 Although some silver Classic Commemoratives are very scarce and valuable, others are quite affordable, even in high grades. The first United States commemorative coin was issued in 1892 in conjunction with the World’s Columbian Exposition in Chicago. These coins celebrated the 400th Anniversary of Columbus’ discovery of America and were sold for $1 at the fair. Nearly one million examples were sold in the first year. The so-called Classic Commemorative series began with the Columbian half in 1892 and ended in 1954 with the Washington/Carver half. In recent years Classic Commemoratives have become one of the most popular series with collectors. There are 144 silver Classic Commemoratives in a complete set, but many collectors try to build a type set, which includes 50 issues. 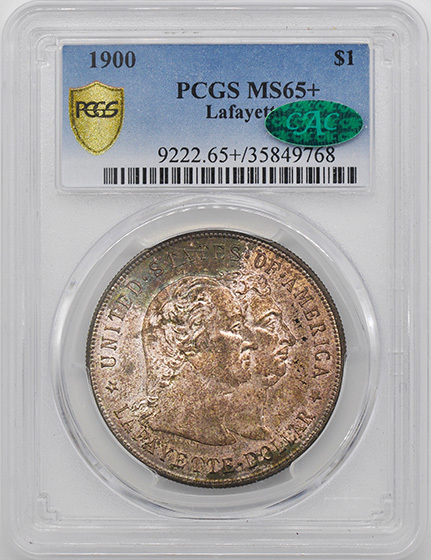 Some issues are quite scarce, and others, such as the Lafayette dollar, have broad appeal and are very valuable. 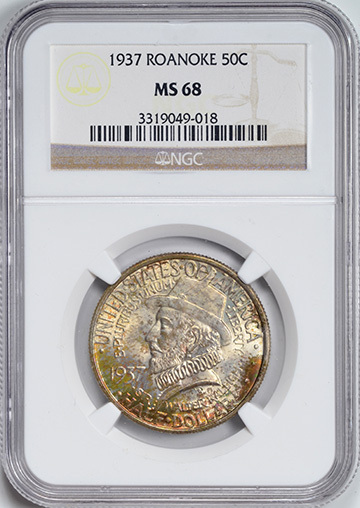 Many Classic Commemoratives, however, are relatively affordable even in higher grades. It is no wonder that this interesting series has steadily gained popularity over the years. GORGEOUS TONING. PCGS SECURE-PLUS. CAC. GEM AMBER TONING. JUST ONE COIN GRADE HIGHER.